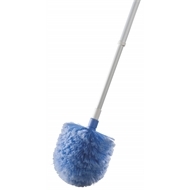 This Oates broom is ideal for indoor use. The contoured shape helps remove dust, dirt and cobwebs from cornices and vents and the extra large head with soft flagged bristles trap dirt. It has a 22mm steel powder coated extension handle.